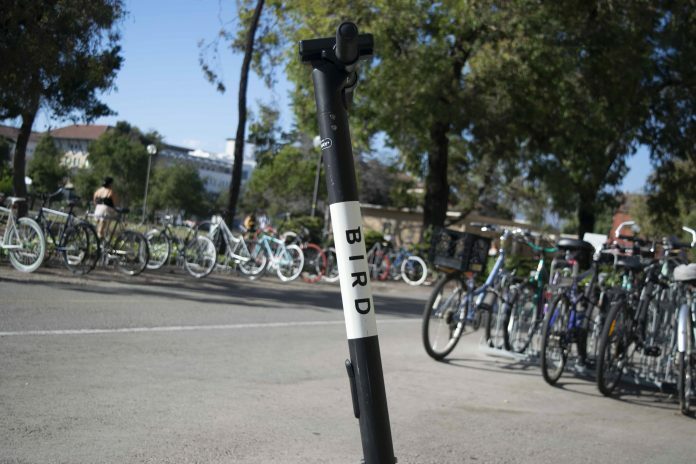 On Sept. 27, residents woke up to the sight of Bird scooters nestled across numerous corners in Isla Vista, making it the second alternative ridesharing company — after HOPR bike-share — to launch in the community before the start of classes. The Santa Monica-based startup, Bird Ride, Inc., has brought the first electric scooters to I.V. Bird requires riders to download a mobile application, have a valid driver’s license, and be at least 18 years of age in order to ride the scooters. The scooters allow riders to travel up to 15 mph in and around I.V. Bird’s unprecedented arrival, however, was a surprise to both residents and the Isla Vista Community Services District, who had been in contact with Bird for a potential public-private partnership. The partnership could likely result in a revenue sharing agreement with Bird, as IVCSD has the opportunity to receive funds as a parking district. The CSD Board discussed the potential partnership during their regular board meeting on Sept. 25. The CSD Board, aware that Bird would land in I.V. sometime during the week, motioned to ask Bird not to operate during that time. An email from the Board was to be sent out on Sept. 27, but by that morning, Bird scooters had already begun to appear in I.V. This is not the first time that electric scooters have launched in Santa Barbara County. Back in June, Lime scooters appeared on State Street without city approval, resulting in the impoundment of more than 100 Lime scooters and an issued emergency ordinance. The issue: the electric scooters were deemed a safety hazard. Efforts are already being planned to mitigate safety hazards in I.V. Interim General Manager Jonathan Abboud told The Bottom Line about a meeting held on Sept. 28 with Bird representatives, where they discussed implementing a new feature to report riders using the scooters poorly. To further ensure safer practices in the community, the Santa Barbara County is also moving forward in writing an ordinance for November. Bird scooters are “staying in I.V.,” Abboud assured. But the scooters are not welcome on campus. Per UCSB’s Interim Powered Scooters Policy, “powered scooters are not permitted on Campus Bike Paths or sidewalks/walkways,” despite Bird’s mobile application map showing several of the black scooters present around campus since its launch. The policy also states that powered scooter share-operators, like Bird Ride, Inc., are prohibited from operating on campus. Unlike UCSB and UC Berkeley — who, in July, impounded Skip Scooters after they appeared on campus without warning — UCLA is the only UC that currently allows a motorized scooter sharing company like Bird to operate on campus. The company launched around UCLA in January and UCPD has since been working to ensure that students follow the appropriate regulations. Though not as receptive to Birds as other university campuses, UCSB has recently embraced other alternative modes of transportation in the form of HOPR. As part of UCSB’s Carbon Neutrality Initiative, the University has teamed up with CycleHop through a three-year contract that has already brought in 600 ride-share bikes to campus and in I.V. An additional 600 HOPR bikes will be added in January 2019. For students who receive financial aid, UC Office of Financial Aid and Scholarships announced that they will be paying half the cost of the $60 annual HOPR membership for the first 1,000 students who sign up. For those interested in learning more about Bird’s accessibility around our community, a representative from the company will be present during this week’s IVCSD meeting on Oct. 9 to answer public questions.